What happened to 100 Thieves in the first week of the LCS? 100 Thieves’ offseason moves raised expectations for the team, but then they fell flat in their first two games. On Thanksgiving day last year, as millions were celebrating the holidays, LCS fans were busy keeping up with a bevy of huge roster changes. The biggest splash of the day was made by 100 Thieves. The Thieves went into the offseason with considerable uncertainty after going through some roster drama at the end of last season. They came out of it with a two-time world champion bot laner and a mid laner who was a finalist at MSI. With heavy hitters up and down the roster, many expected 100 Thieves to contend for an LCS championship this year. Finally, it seemed like we had a team truly worthy of beating defending champions Liquid or Worlds semifinalists Cloud9. 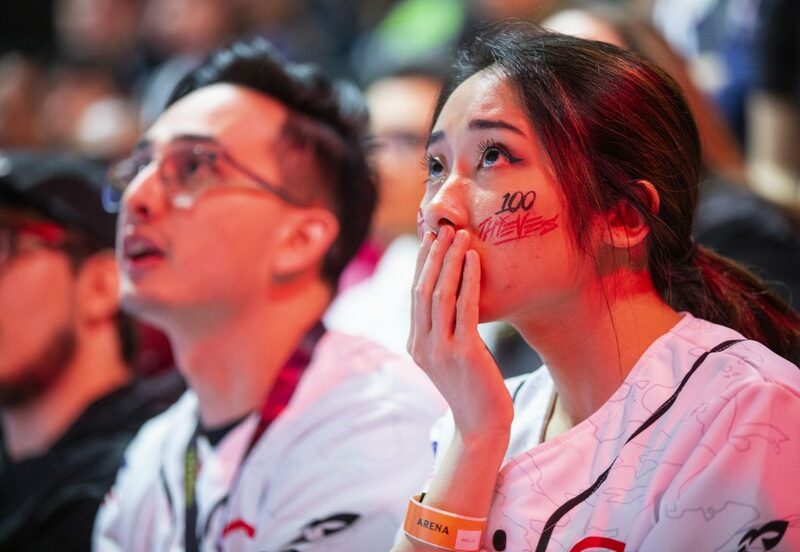 Instead, through two games this split, 100 Thieves have yet to pick up a single win. So what is going on with this team? Is it a short blip on the radar, like what Cloud9 faced in the early parts of last summer, or something more nefarious, like the synergy issues that dogged TSM all of last year? Most likely, it’s something in between. Heading into the year, the biggest question mark on the roster was mid laner Choi “Huhi” Jae-hyun. Huhi has a pretty standard mid lane mage champion pool that he likes to supplement with oddball picks like Aurelion Sol or Ekko. We wrote before the year that Huhi was one of the top five players to watch in the region. So far, he’s not had a good time. Huhi’s never been known for his laning—he’s perennially at the bottom of the mid lane table in CS and experience differential at 10 minutes. Some of that could have been forgiven on his previous team, CLG, where he didn’t really have anyone to help alleviate pressure. The thing is, he has that on 100 Thieves. In theory, both side lanes should draw a ton of attention and help control the river. We’ve seen glimpses of that in 100 Thieves’ two games so far. But in each one, that river control simply fell apart as the other team seized mid laner priority. Huhi’s still putting up extremely weak lane numbers. In the team’s first game against TSM, he could not keep up with lane opponent Søren “Bjergsen” Bjerg on rotations to the river. Things would only get worse for Huhi in the team’s second game of the week. He fed over a kill to Cloud9’s Yacin “Nisqy” Dincer—blowing flash in the process. It’s early in the season, but it’s clear now that Huhi’s lane weakness isn’t something that can be easily overcome. You could argue that he was against two of the strongest mids in the region last week, but isn’t that the point? How can 100 Thieves legitimately contend for a title if their mid isn’t at least in the top half in the region? Huhi’s struggles have cast a shadow wide enough to obscure some of the issues elsewhere on the map. 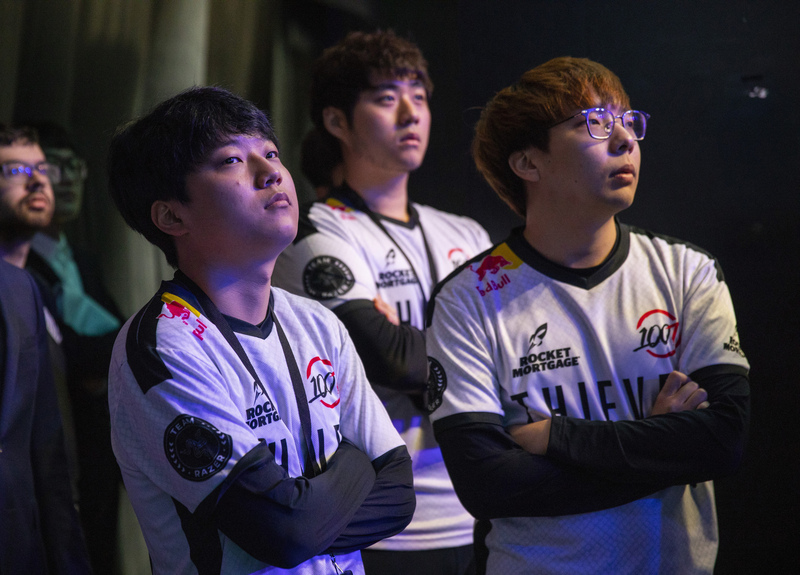 The biggest one has been 100 Thieves’ lack of bot lane pressure. 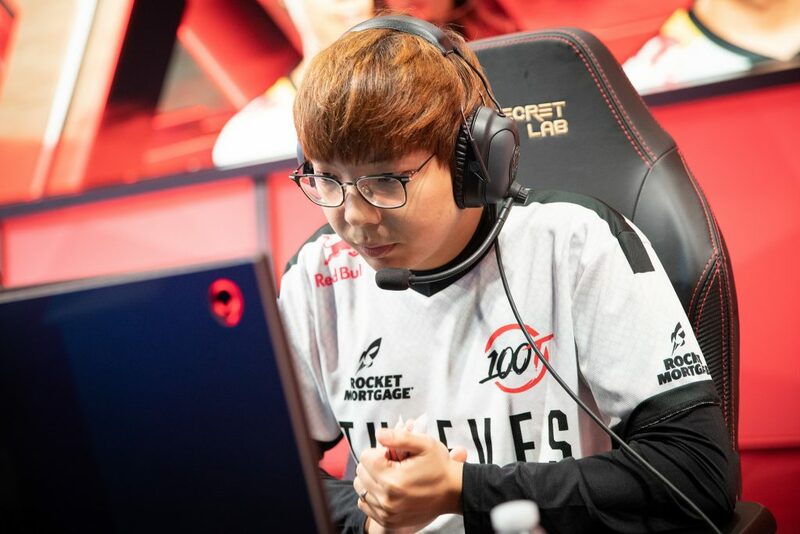 New AD carry Bae “Bang” Jun-sik, the world champion the Thieves signed from SK Telecom T1, hasn’t been the dominant laner we might have expected. Sure, he didn’t have the most oppressive lane in the LCK. But that’s a region that’s produced some of the best ADCs in the world. It was reasonable to assume things would be different with new lane partner Zaqueri “Aphromoo” Black. So far, they’re not, and that’s concerning. He was unable to take advantage of a strong Lucian matchup against TSM. In the match vs. C9, his lane didn’t have the same level of kill threat, but he was also going against Zachary “Sneaky” Scuderi, who is mostly a defensive laner. Even before Huhi died in mid lane, Bang wasn’t getting any discernible pressure on Sneaky in bot lane. A team doesn’t need to win every lane to be successful. But it can’t consistently lose lane either. Even with all these issues, it’s no time for 100 Thieves or their fans to panic. We mentioned before the season that it may take some time for Bang and Aphromoo to build chemistry. Both are veterans and thus have fallen in to habits. 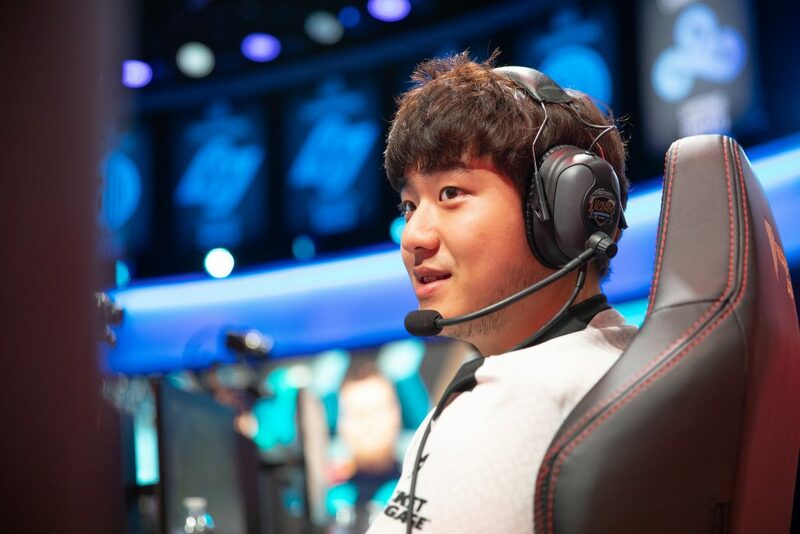 Bang hasn’t laned with someone other than former SKT support Lee “Wolf” Jae-wan in years. Aphromoo’s been paired with mostly young players in recent years, ones he can kind of boss around in lane. It will take time for them to figure out what works in their relationship. The other good news is that the team generally knows how to play. That’s an underrated aspect in a chaotic region like North America. Jungler Andy “Anda” Hoang has been in the right spots, but he’s just running into more members of the enemy team since the Thieves don’t have lane priority. Still, that’s better than being clueless as the map falls apart. So even though the team sits in last place, they might be okay. It does look like they may need to tweak their style to focus more on scaling into the late game and waiting for the enemy team to make mistakes. Learning how to teamfight together with tank comps could be good for everyone and contribute to some wins in the coming weeks. This team is filled with too much talent to see them struggling forever. The issue is, after qualifying for Worlds last year and having the strong offseason they had, people are expecting more. But the thing is, the Worlds appearance came at the end of their evolution through last year. We’re at the beginning of a whole new season. Having some perspective and patience would go a long way for both the team and its fans.